Wow, I did not think she was that small. Looking at her with the MV Tacoma. She has benches on the sun deck. The Chetzemoka has individual metal seats next to each other. It will be rather interesting to see what's the same and what's changed between the two boats. They seem to be making fine progress. This is the sun deck of the Chetzemoka, for comparison. Taken from the Admiral Way Viewpoint this afternoon, we see the SALISH and KENNEWICK together. The SALISH's facial nameboard looks quite small. SEATTLE — Washington State Ferries said on Thursday it will take delivery of the new ferry Salish a week late as Todd Pacific Shipyards completes work on the 64-car vessel. The ferry, which was supposed to be delivered on Thursday, still needs a dockside demonstration to the Coast Guard of certain tests and equipment, such as alarms and monitoring systems. Some cleaning and touch-up painting remains to be completed. Todd will demonstrate the systems to the Coast Guard next week before a Certificate of Inspection is issued. The work on the Salish does not involve any unexpected or unusual issues, as occurred on sister ship Chetzemoka when vibrations were discovered during sea trials, according to WSF. Todd can be assessed $5,000 a day in damages for late delivery, per the state's contract with the shipbuilder. This determination will be part of the final settlement. The Salish will join the Chetzemoka on the Port Townsend-Coupeville route in July. 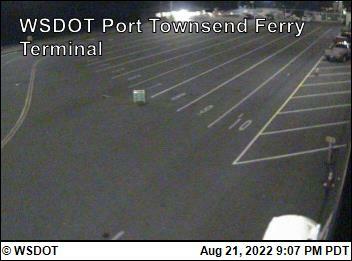 Todd anticipates early delivery of the third 64-car ferry, Kennewick, before the end of 2011. For more information about the new ferries, visit www.wsdot.wa.gov/Projects/Ferries/64CarFerries. I am thinking about taking a trip down to Washington State in July when the Salish goes into service so I can take a ride on both the Salish and the Chetzy! I hope WSF gives ample notice for when she is going into service but seeing I dont think they are planning any events for this one I might not actually go for the first day service. That would probably be best since a start date has not been announced yet. Given that delivery has been pushed back, I would expect the start date will also be pushed back. Even when a date is announced, I will not put money on it being the final date. I think the Chetzemoka's date changed twice because of small problems that came up. Granted, this is the second boat of the batch. I'd hope that the date sticks and that there will be no problems arising that weren't fixed since the Chetzemoka. I don't think that you'll have any repeat problems from the Chetzemoka. My bad, I read the post I made last night and it did not make sense to me . I should be banned from the computer right before going to bed. I was meaning to say that she will not (I hope) have the same problems as the Chetzemoka. Although, I did forget about the controllable pitch prop thing. It is a boat and has a lot of different components from different companies. Everybody is super happy when everything works out perfectly, but that rarely happens. I do not want to discredit any particular company, but with all of the components in there, something is bound to fail or get the hiccups. They must take "deliver at close of business" very literally as Salish just went by my office window under tow, which would probably put her at Eagle Harbor almost exactly at 5pm. And, she was being towed by that familiar tug participating in this program. That trusty WESTRAC. Be sure to click "F5" to refresh the image! Todd Pacific Shipyards delivered the MV Salish ferry, which is destined for the Port Townsend-Coupeville route, to the state ferries system Thursday. The 64-car Salish ferry is expected to restore two-boat service to the Port Townsend-Coupeville route in July. “We feel a great sense of satisfaction after having built and delivered this complex vessel,” said Steve Welch, president of Todd Pacific Shipyards, in a statement released by Washington State Ferries. The Salish was towed from Todd’s Harbor Island location to Eagle Harbor on Bainbridge Island at the close of business Thursday, the state ferries system said. Early next week, the ferry will be towed to Dakota Creek Industries in Anacortes and then will return late this month to Eagle Harbor, where state Department of Transportation crews will add more landing lights, finish outfitting the rescue boats and close gaps in the handrails, the statement said. Shipyard crews also completed touch-up painting and cleaning over the past week. After these modifications, the Salish will be ready for crews to train onboard, first around Puget Sound and later on the Port Townsend-Coupeville route. The Salish originally was to be delivered May 5 but was delayed a week to finish demonstrations for the Coast Guard to receive a certificate of inspection. It is the second of three Kwa-di Tabil Class boats contracted by the state at a cost of $213.2 million to be built by Todd Pacific Shipyards in Seattle. The first, the MV Chetzemoka, began service on the Port Townsend-Coupeville run in November while the third, the MV Kennewick — destined for the Point Defiance-to-Tahlequah route once it enters service sometime this winter — is now under construction. “We’re excited about the Salish, and we can hardly wait to get two boats back in service for the Coupeville and Port Townsend communities,” said Assistant Secretary David Moseley. Both the Salish and the Chetzemoka will operate on the route until Sept. 25, when one of the boats will be used to cover routes throughout the system as boats are taken in for servicing, the state ferries system said. 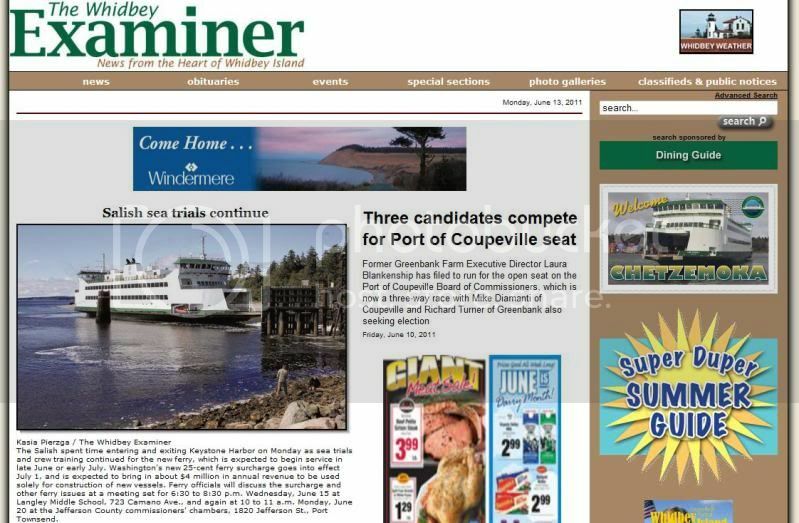 Two-boat service on the Port Townsend-Coupeville route will resume in the spring. I took a trip to Bainbridge today to see the new SALISH. The new SALISH joins the fleet with the TILLIKUM and HIYU at the VMC. Ah ha, the other article left this bit out...Dakota Creek gets the "honor" of installing the rubrails. 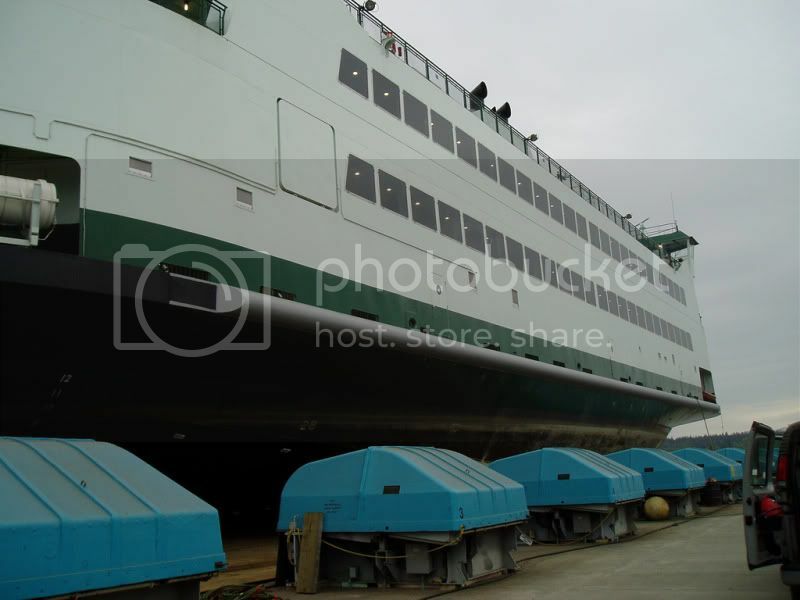 Posted May 12, 2011 at 3:33 p.m.
SEATTLE — Washington State Ferries accepted a second new 64-car ferry, the Salish, from Todd Pacific Shipyards on Thursday. The Salish will join sister ship Chetzemoka and restore two-boat service to the Port Townsend-Coupeville route in July. The Salish was to be delivered May 5, but Todd needed a few extra days to finish demonstrations for the Coast Guard to receive the vessel's Certificate of Inspection. Shipyard crews also completed touch-up painting and cleaning. The Salish will be towed from Todd's Harbor Island shipyard to Eagle Harbor on Bainbridge Island this evening. Early next week, it will be towed to Dakota Creek Industries in Anacortes to have rub rail installed, and will return to Eagle Harbor in late May, where WSF crews will add more landing lights, finish outfitting the rescue boats and decrease gaps in the handrails. Then it will be ready for crews to train onboard, first around Puget Sound, and later on the Port Townsend-Coupeville route. The MV SALISH is now in Anacortes for her rub rail work. 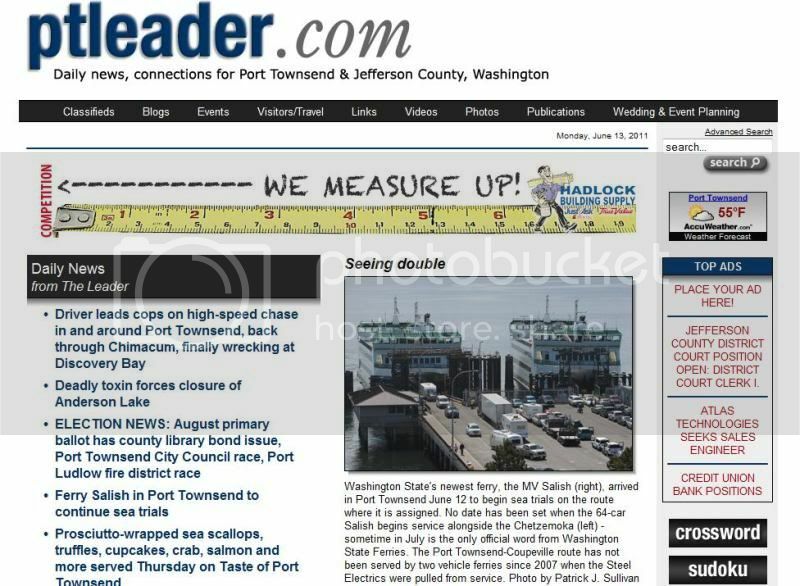 The PT Leader and MarineTraffic show nice photos of her out of the Salish Sea for the work. This photo shows the rub rails in the foreground. WSF has added more photos to their SALISH collection. The photos show the new guards next to the Main Deck entries, the trimmed end bulwarks, and the new rub rails. Now, that looks better! The rub rail is connected all together, rather than separated as we see on the CHETZEMOKA. Looks like a few further modifications to the CHETZY are in store during the next maintenance season. Fantastic. After reading the IFB I was worried they weren't going to fix that gap issue. Glad to see that was not the case. And yup definitely looks like Chetzy will be hitting the shipyard in the autumn. I'm sure they have lots of little annoyances to fix at Eagle Harbor also as it's a new boat. I was watching the ship trackers this morning to see if any of the tugs participating in the movements of these new ferries was in the northern areas. Yes! The WESTRAC II went as far north as the eastern entrance of the Juan De Fuca Strait. A tug from Anacortes swapped something with her. 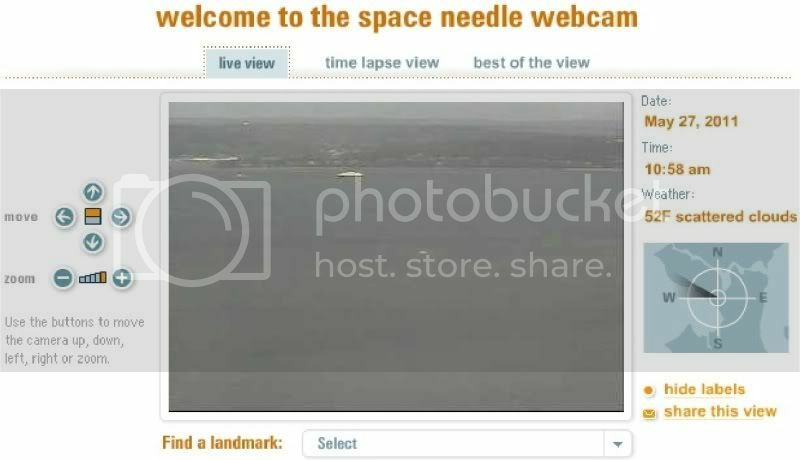 A webcam capture from the Space Needle shows this was the SALISH. The tug WESTRAC II was seen towing the SALISH to Eagle Harbor as seen from the Space Needle cam. 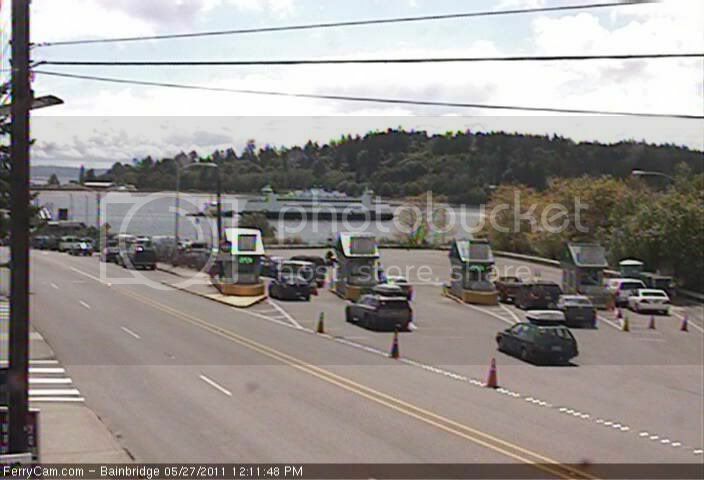 From the lens of this cam from ferrycam.com, we see the SALISH back in Eagle Harbor. The next movement of the SALISH may, most likely, be under her own power as crew training is forthcoming. I was talking to the agent at Southworth and the Salish is supposed to be coming down to do some docking there next week. The timing was rather vague though. Not sure what day and when it's supposed to be. I'll be busy getting training for the terminal position. 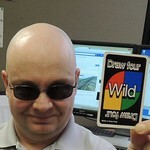 The bid results came out today and when I'm free, I will on-call at the Coupville dock. Not the closest place to Port Orchard, but that's what I get, being #205 out of 206 on the Terminal/Traffic seniority list. The Salish was doing sea trials today. Spotted her west of Blake Island this evening. Salish is just leaving Eagle Harbor this afternoon again for another round of trials. Today she appears to be all on her own though whereas yesterday she was accompanied by a tug. She also now has the obligatory entry under the fleet guide. The SALISH is now in Port Townsend with her sister CHETZEMOKA. She had a bit of an extensive session today, according to the daily movements as seen on MT. The visual log showed her going to Colman Dock from Eagle Harbor and back. Then, from EH to Admiralty Inlet and her first landings in Keystone Harbor. Then, over to Port Townsend where she will commence the real crew training sessions on the Keystone Harbor run before her public sailings. I guess that the Peninsula Daily New and the Port Townsend Leader will be publishing photos of the SALISH soon as well as papers on Whidbey Island. 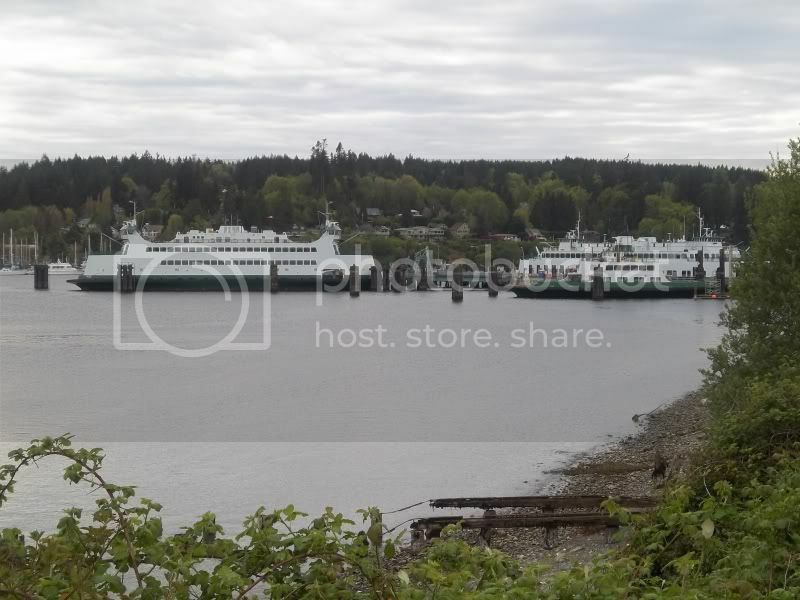 And, we have a long awaited photo of two state ferries in Port Townsend, once again, courtesy of the Port Townsend Leader. It looks like her stack has been branded already.